We have crossed over the non-border from Morocco to the disputed territory of Western Sahara. So, let us look at this place objectively. If it were an allowable Scrabble hand then maybe this could be the only thing positive to say about it. Morocco is known as the festival capital of Africa and Foum El Oued pulls out all the stops with its year round Litter Festival. It is so welcoming to see the streets decked in a multi-coloured spectrum of plastic bags. The constant howling wind enhances the effect to bring a poly-sensual experience of being battered at all levels by the unwanted flotsam. Like much of Morroco it is hard to see if this place is half built or half destroyed. Everything is in a one storey windowless limbo land. To me this place is like the Gaza Strip without the tunnels and incoming missiles. Not that I have been to the Gaza Strip, but I have watched the BBC News. 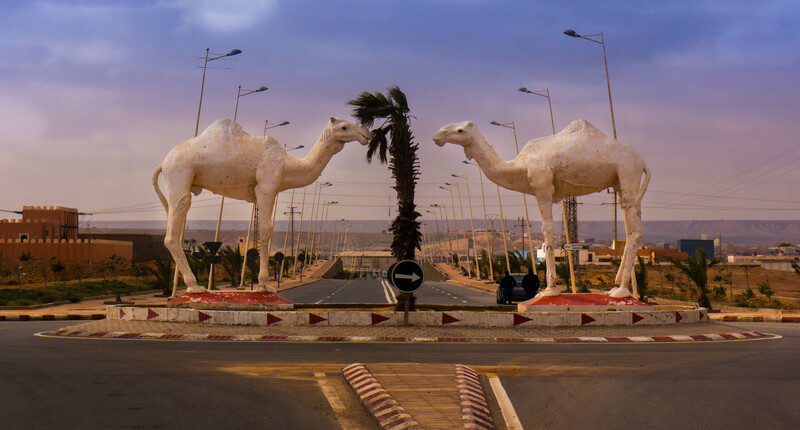 Before we got here we passed through the splendour of Laayoune, the capital of Western Sahara. A city only founded in 1938 as a Spanish outpost whilst they were the masters here. I am no town planner but I suspect it was not the same chap that laid out the expansive boulevards of Madrid or Sevilla. Like the rest of Western Sahara it can be added to our fast growing list of things not to see or do here. Laayoune does boast the most bizarre supermarket we have ever seen. It has multiple aisles of soap powder, including racks of your grannies favourite; OMO. Shelf upon shelf of biscuits, fake football shirts and furry dressing gowns. It even has a whole section of wine glasses where the nearest wine for sale is 500 miles north and only one cabinet of fresh food. And inside that cabinet was one frozen chicken and one bag of frozen calamaris. We presumed it must be some sort of pre-glasnost Russian theme park. Tracy loved it. We might not be staying long here and we should have smelt a desert rat when the border guards were just a creepy bit over friendly. The journey from Tan-Tan Plage was rather enjoyable though and we did pass through some great desert scenery and here are the pictures. I will take some pictures on the way back as the light today was not the best. But, we did drive through miles of sand dunes whom at times engulfed the road, saw camels roaming free without their feet tied or being topped with a screeching European. We witnessed our first expanse of Subkha. Subkha is like a geographical Crème Brulee. It has a hard crispy covering which hides a swamp like recipe of quicksand beneath. Frolic upon it at your peril. I feel sorry for Tan-Tan. It is only one letter away from being named after Belgium’s young super sleuth. Instead it is an acned youth of a place with little going for it. Who would have thought swapping one vowel for another could have such a devastating outcome. Beware name choosing pregnant people. We did eat out here as they had rows of restaurants purveying spit roasted chicken and our taste buds were a rumbling. What we didn’t know was the chickens on the spit were rubber and we were served up some deep fried old rooster. Who would have thought Scottish cuisine had travelled this far? Some pictures of Tan-Tan including the offending restaurant. Ah forgot to mention the Camel Statue. So here it is. Cute eh? Homie Help: One of the most common tasks we do is to empty the toilet cassette. This task for us has been allocated a status of heavy domestic, loosely translated, mens work. Now I don’t mind apart from the problem of foot related spashback. 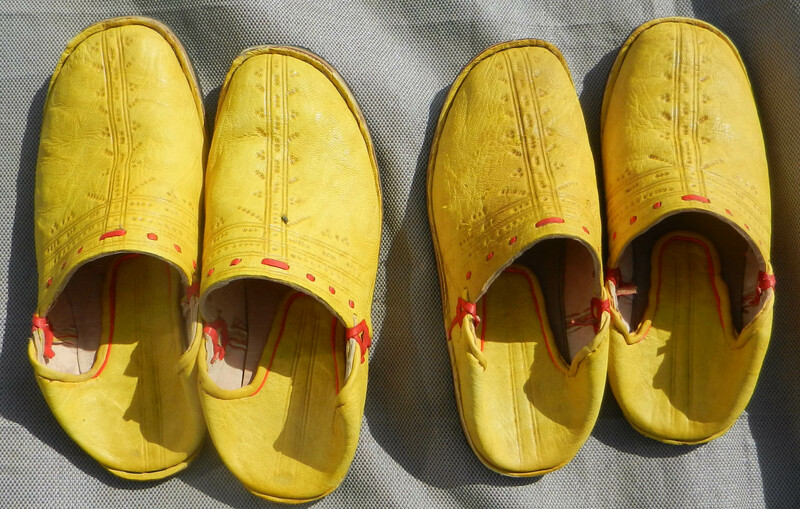 So I devised a cunning plan where I purchased his ‘n’ hers Moroccan slippers and I can sneakily wear Tracy’s slippers when emptying. Clever old me. That’s all from me and I’ll leave you with Tracy to say a few words. Colour supplement: Men are so predictable. Why would I want to wear Moroccan Slippers? No, I thought, there must be a catch and I was right. Adorable husband thought he could trick me and laugh at my expense. So last thing every night I swap the slippers around and go to sleep with a wry smile.